We've heard a lot at MomsRising about having Rosie the Riveter as a logo. Most of the comments have been from women of color who feel that Rosie doesn't represent them. One of the most eloquent comments on this has been from Jennifer James, who wrote a well-researched entry on the Black Breastfeeding blog on why she couldn't support MomsRising while Rosie was our logo. Here's my response. Addressing these things honestly and forthrightly and lovingly can be scary, but sometimes we have to do the scary thing. "Hi Jennifer! I'm a woman of color on the MomsRising executive team, and I'm so glad you brought this up on your blog. Most of us on the team know that Rosie means different things to different people. You eloquently showed the truth of that in your original blog post. I'm proud to be part of this team because we're really responsive to member input. We've been hearing about the need to demonstrate more diversity in our materials, and I couldn't agree more. Instead of using an image that means different things to different people, we want to show that we've got a single message-- to build a truly family-friendly America. Not just for some people, but for every single person who considers themselves a caregiver. A diverse group indeed! One of the deepest experiences we've had regarding race had to do with the petition on Imus we wrote when his comments came out. There was a lot of thoughtful discussion on the team about whether this was within our M-O-T-H-E-R-S platform. I urged MomsRising to take this on because I felt that as a mother, I had to speak out against this - what kind of media do I want my daughter consuming? What messages do I want her hearing, believing? Definitely not the tripe coming from Imus and his ilk. I felt this fit squarely in our T platform (Television We Choose and Other After School Programs). There was disagreement and respectful (and passionate) discussion. 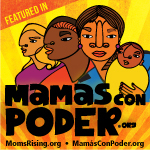 Though there were plenty of people (frankly, probably white) who told us they didn't see why MomsRising was addressing this, I remain grateful that there were and are plenty who see exactly why it's so important for MomsRising to stand up against bigoted comments and stand up not only with people of color, but as people of color. Diversity is not a peripheral goal- it's integral to the growth and integrity of our organization. I hope that one day very soon, the membership of MomsRising will reflect the vast diversity of mothers/caregivers in the US. How powerful we'll be when we all stand together! Thanks again, Jennifer." Happy ending-- after Jennifer heard straight from the top (our ED, Kristin, wrote to her and invited her to blog at the MomsRising website), and heard that we're not using Rosie as a logo anymore (after hearing a ton of comments about it), she saw that MomsRising includes her, too. Peace!